We are just a week away from that special night when the man in red descends chimney after chimney, delivering toys to good girls and boys the world over. When Old Saint Nick finds his way to your home, you may find yourself on his naughty list if he makes certain lump-of-coal-worthy discoveries in your chimney. 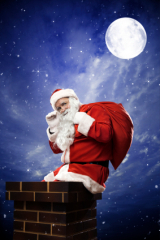 Because they can increase the risk of a dangerous chimney fire or carbon monoxide intrusion into your living space, here are four things you don’t want Santa to find in your chimney. Creosote is the Grinch in your chimney. It smells gross, is corrosive and combustible and may even be gummy and sticky. Over time, creosote, which is a byproduct of burning, builds up on chimney walls, creating a potentially-serious fire hazard in your home. Annual inspections and regular sweeping by a CSIA Certified Chimney Sweep will help prevent creosote buildup. Cracks and breaks in your chimney’s wall can give dangerous gases and fumes direct access to your living space. Properly lined and sealed chimney walls ensure gases, like carbon monoxide, are safely pulled from your home when your heating system is running or a fire is burning in your fireplace. Water stains on the mortar of your masonry chimney are an indicator that the elements are getting inside your chimney walls. As it is with many home appliances, water exposure causes trouble when it comes to your chimney. Whether it’s rusted parts or a decaying foundation, water can cause your chimney system to fail in many different ways. Critters may think your chimney provides just the kind of dry, safe home they’re looking for, but animals and their nests in your chimney could block gases from escaping your home and can be a fire hazard. The good news is that most animals can easily be removed and located to new homes. Remember, you can find a CSIA Certified Chimney Sweep at our website: www.csia.org/search.